Music has always been a very strong influence in my life. Even though, I did not have the privilege of having much formal training in music as a young person, we learned to play and sing music a lot in my home. My earliest memories were of my sister and me learning to play songs on a miniature organ. My sister always had more natural talent than I did, but I enjoyed music and managed to learn to play a few songs with one finger. In all of my years as a child I would sing regularly in little church choirs, and later in an adult choir. My mother would have us singing hymns around the piano, probably almost everyday of our young lives. I acquired a degree in elementary education which I have used in the classroom when I wasn’t home with my young children. Music was present in my life in choirs and choral singing, but still I had not begun any serious formal training. I took a few music classes in college, but that was it. I did not begin formal music training until after my son was born. It was at this time when my son was still very young that I was determined to learn to play hymns for our small church congregation. I began 5 hours a day of intense practice on the piano. (My poor husband!) After 6 months, I began playing, and I grew quickly. I led a small church choir and organized special music. I was able to take about a year of formal piano lessons where I grew so much more. After my daughter was born, I decided to learn guitar which required a little more paced practice, as the guitar is a more physically challenging instrument. I learned chord strumming quickly. When my daughter, Abby, was 2 years old, I began bringing her to Mountain Top’s class for toddlers (with Jess West). We loved it. 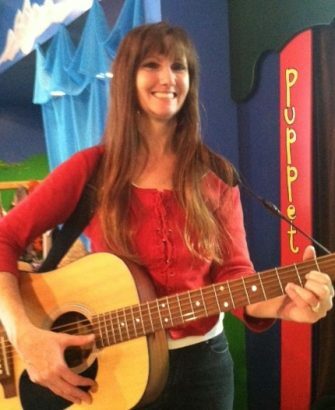 When she was in preschool music with Ellen, I decided that I would love to see if I could teach music to children at Mountain Top Music Center, so I asked Ellen about employment, and well, here I am enjoying the most exciting job of my life. I have so much enjoyed every aspect of teaching and have grown so much musically. I love music and children, so I guess you could say that there isn’t anything I would rather be doing. I have just completed a CD which includes some of the songs that I enjoy singing with the children here at Mountain Top thanks to Chad Cummings spending many hours and days in the recording studio with me. I’m sure there will be more CD’s if it all works out! Music has always been my joy, my healing, and a means of expressing every emotion I feel. Mountain Top Music Center has let me turn this love into a career.